The Italian revolutionary and patriot Giuseppe Garibaldi died on this day in 1882 on the Sardinian island of Caprera. The 74-year-old former military general and left-wing politician, whose Expedition of the Thousand was a major factor in completing the unification of Italy, had spent much of the last 27 years of his life on the island. Increasingly confined to bed because of crippling arthritis, he was living on his farm with his third wife, Francesca Armosino, when he passed away. 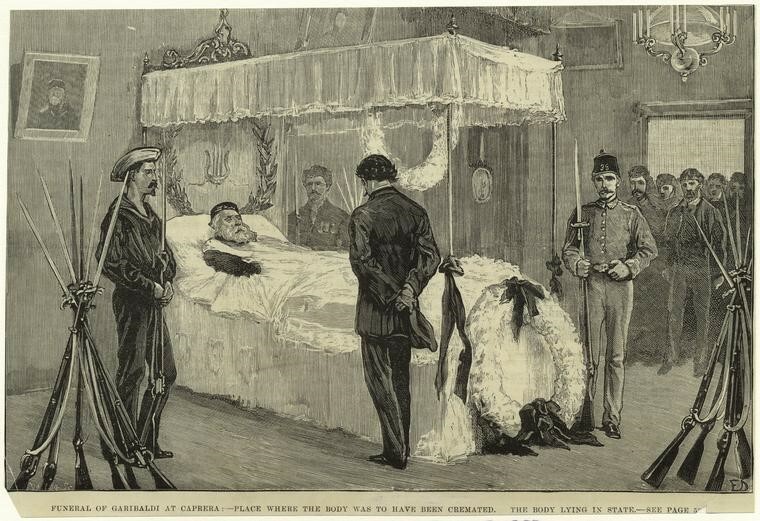 Knowing he was fading, in the days before his death Garibaldi had asked for his bed to be moved close to a window, from which he could gaze at the emerald and sapphire sea. He has asked for a simple funeral and cremation, and had even nominated the place on the island where he wished his body to be burned, in an open coffin, with his face to the sun. He had hoped his ashes would be handed over to ordinary Italians, to be mixed with the earth in a place where a garden might grow as a symbol of the new Italy. But his wishes were ignored. 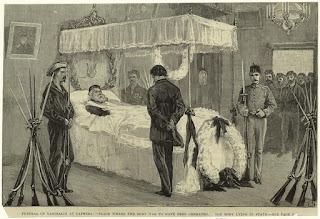 His body at first remained in his four-poster bed, guarded by a soldier and a sailor, while a succession of people filed past to pay their respects. 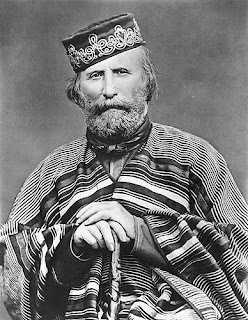 Garibaldi’s body was then placed in a tomb in the gardens of his farmhouse, although his great-granddaughter Anita Garibaldi, named after Giuseppe’s Brazilian first wife, believes his body may have later been removed by supporters eager to honour his wishes and have it cremated. 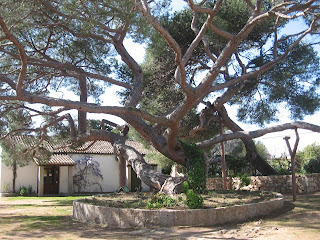 His association with the island of Caprera goes back to what is thought to have been his first visit in 1849. In 1855 he bought half the island using his legacy from his brother, Angelo. After the Expedition of the Thousand concluded with his handing over of Sicily and Naples to Victor Emmanuel II in November, 1860, he retired there, although his military campaigning was not over and he made two further attempts to capture Rome for the new Italy. On both occasions, however, in 1862 and 1867, the French support for the Papal army proved too much. On the second occasion he was arrested and held prisoner and his release was effectively conditional on him going into exile on Caprera. Garibaldi remains an Italian hero and statues of him stand in many Italian squares and around the world. There is a bust of him directly outside the old Supreme Court Chamber in the US Capitol Building in Washington, DC. He is even commemorated in Nottingham, England, in the colours worn by the football club Nottingham Forest, whose red shirts were based on the uniform worn by Garibaldi’s followers. 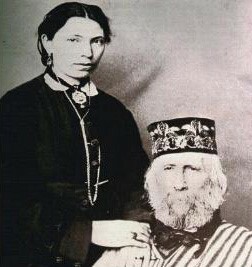 Indeed, one of the club’s nicknames is the Garibaldi Reds. 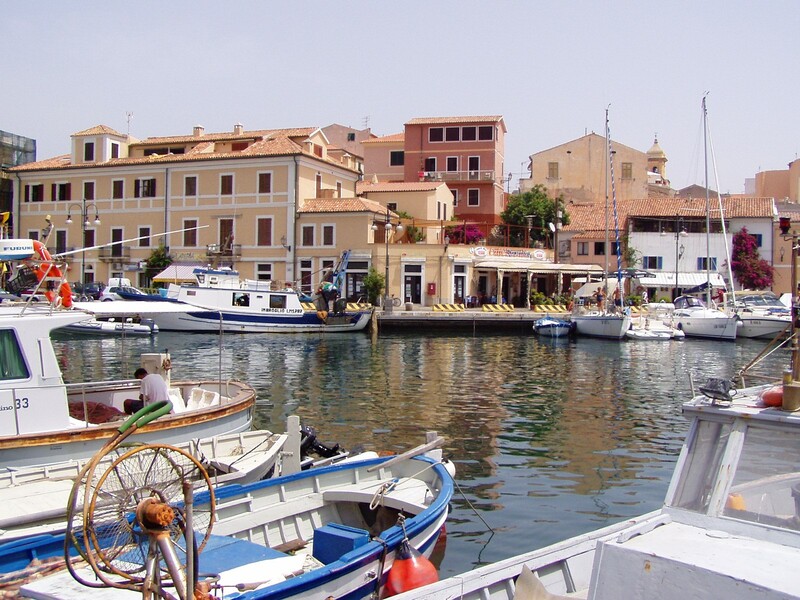 The island of Caprera, off the northern tip of the much larger island of Sardinia, was populated in the early days of the Western Roman Empire, as was evidenced by the discovery of the remains of Roman cargo ships there. It was unoccupied for centuries thereafter and the pinewoods that cover the island today began with trees planted by Garibaldi. Today it is a natural reserve for the royal seagull, the cormorant and the peregrine falcon. Garibaldi’s house nowadays is open to the public as a museum. 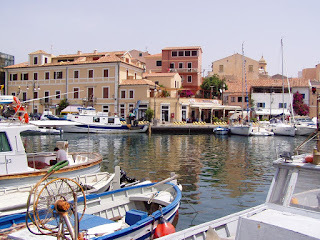 The island of La Maddalena, which is connected to Caprera by a causeway, is renowned for its beaches and attracts many wealthy tourists to anchor their yachts in the harbour. Like Caprera it was deserted for many centuries after the fall of the Western Roman Empire but began to develop in the late 18th century when a town of the same name was established under the occupation of the Savoy-Piedmontese kingdom. The road linking the town’s port area with the central Piazza Umberto is named Via Garibaldi.